By Bob Hibler, Marketing Czar at Gamka Sales Co., Inc. The allure of beer, brats and the competitive nature of members of the concrete industry brought a large crowd to Gamka Sales Company’s World Headquarters in Edison, NJ in the afternoon of November 3rd, 2010 for the Great Gamka Wacker Neuson Concrete Trowel Challenge. The big draw was to see and hear the grand prize custom Wacker Neuson ride-on trowel to be awarded at the World of Concrete in Las Vegas next February. The CRT48-35VX is loaded with chrome and sports straight pipes, loud enough at 125 dB(A) to make most Harley Davidson motorcycle riders envious. So…what is the Concrete Trowel Challenge? 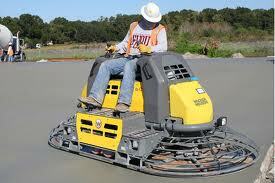 The Concrete Trowel Challenge began as a simple contest between friends one year at World of Concrete. They used the demo concrete slab poured in Wacker Neuson’s outdoor booth in Las Vegas at World of Concrete and maneuvered a ride-on concrete trowel through an obstacle course to see who was the fastest finisher. The fastest operator to scoot through the obstacle course will be crowned the fastest finisher, winning the customized trowel. At Gamka World HQ there was a good mix of contractors, concrete finishers, labor representatives and contractor association administrators in the group, all of whom were there to get a “taste” of this prequel to the Las Vegas grand finale. Attendees walked though a gauntlet of Wacker Neuson equipment on display in the yard and right by the outdoor barbecue with the broiling brats, especially imported for the occasion from Wisconsin. Inside the warehouse there was more equipment to see and a long table laden with the fixin’s for the brats, beer and beverages. More Wacker Neuson small equipment was on display near the registration table where everyone who signed in received a custom Wacker Neuson Concrete Trowel Challenge tee-shirt, hat, free entry to the 2011 World of Concrete and a chance to scope out the trophy table for the top finishers in the timed obstacle course. The actual Challenge was run in the six bay indoor truck loading area. Contenders were below the spectators who had a bird’s eye view of each contestant as he or she raced against the time clock. As each rider mounted his concrete trowel, they would nail the throttle and jam the sticks forward as the judge shouted, “Go!”. The racers were required to go around the rectangular course first and then do a double U-turn inside before rounding the back half. A one second penalty was added to their score for every traffic cone touched or wall scraped. The look of concentration on the contestant’s faces was clear to all as the sparks flew off the trowel blades spinning at well over 100 RPM. At the conclusion of each run the rider’s elapsed time was entered into a computer to be projected on a big screen along with the name and company affiliation of each participant. As each score was entered the screen would be updated by rank. All this enhanced the rivalry among the Challengers and the spectators saw numerous reruns by operators who want to have their best time posted. Shortly after 7:00 pm the last man finished his run and the winners were announced. In first place was Joe DaSilva of A-Tech Concrete with an incredible timed run of just 28.5 seconds. As Top Gun, Joe was awarded a gift card to TGIF. In a very tight second place was Andrezy Niedzialek of AJS Masonry with a score of 28.68 seconds, so close! In third place was David DaSilva of A-Tech and also Joe’s brother, with a time of 29.16 seconds. Andrezy, David and eight more participants all received Gamka 2010 Concrete Trowel Challenge trophies. All who ran the obstacle course got a Wacker Demo Truck mini-model as a memento of the spectacle and their part in the race against the clock. Every attendee got their fill of hot brats, beverages, noise and excitement. It was a cool November day but the action was hot. Look for a repeat next year!